When I was a teenager, I picked up a novel about a girl falling in love with a ghost. It was an interesting premise, but I was disappointed quickly as it turned out the boy wasn't really a ghost. He was simply disembodied while in a coma and the story ended with an all too predictable awakening and true love was found. On a Bruised Road is about a ghost, too. There is very little predictable about it. Edwin Masters has been obsessed with a car for decades, a 1962 Alfa Romeo Spider 2600. It's not the type of vehicle car buffs obsess over, but Edwin isn't himself a car buff. His reasons for wanting that particular car aren't revealed right away, but from the moment he slips behind the wheel of the one he's buying his life will never be the same again. It was the absinthe that did it. At least, that’s what Jacob says. I don’t believe him. My memories of that Halloween may be fuzzy, but they’re clear enough for truth, and if Jacob wants to blame the absinthe that’s fine with me. Let him. I know where the responsibility lies, but I won’t tell them. I don’t want to. This was the first film adaptation of the Gaston Leroux novel of the same name. 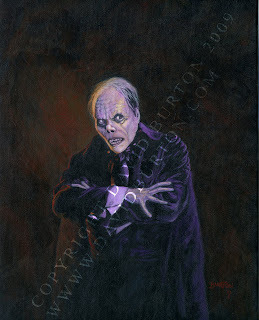 By now, we're all familiar with the story of the Phantom, who uses mayhem, fear, and murder in order to manipulate the management into making the woman he loves a star. It's generally considered to be the most faithful of the adaptations, but there's one big difference. This difference is so wonderfully, well, Hollywood, that I can't help but love it. Instead of a history of studying in Persia, the Phantom is instead an escapee of Devil's Island and is skilled in the "dark arts." 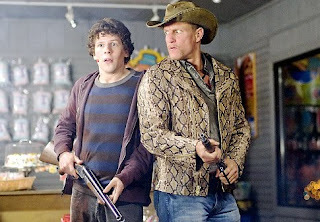 As soon as I saw the trailer for Zombieland, I knew the movie would be pertinent to my interests. Mainly because my interests include Woody Harrelson and zombies. I also enjoy humor and people getting hit in the face with banjos. So far, I've seen the film twice. After the first viewing, I gave the film an A- rating, but after the second one I'm going to bump that down to a solid B. Not because I didn't like it (I really enjoyed it a lot) but because the humor doesn't stay fresh. The film is naturally going to draw comparisons to Shaun of the Dead, and quite frankly, the humor in Shaun of the Dead holds up better after repeated viewings. But I'm not going to waste my time comparing Zombieland to its cinematic predecessor, because it's not really fair. But there are two points in which it is fair to compare them (besides the humor). They're both Zombie Romantic Comedies, and they both deal with the issue of agency--or rather, the issue of being the hero.